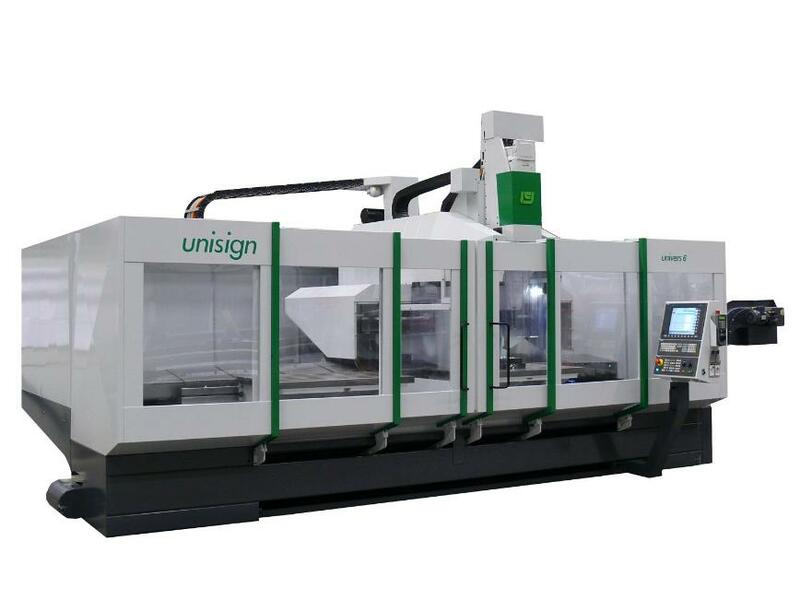 Particularly suited to heavy machining of work pieces up to 8 metres long, the compact Univers 6000 combines high accuracy with a large work envelope. The unique right angle head allows for multi-sided machining to increase production flexibility. The sizeable working area can also be divided into two work zones for pendulum machining. Uniquely, the vertical main spindle of this travelling column machine can be gearbox driven, bringing increased torque of up to 1.000 Nm. This makes it possible to mill toughened materials and use larger tools. The Univers 6000 is easily installed and can be operational very quickly. The raised guide ways and large work envelope make it the perfect machine for big and especially long work pieces such as beams and traverses, truck axles and trailer side members. Advantages like remote machine monitoring from Unisign’s own service centre ensure high uptime and a good ROI. On the one hand this is a powerful multi-use machining centre with a large work envelope. On the other hand it can be used as the basic platform for a variety of customer specific solutions. Usability is enhanced thanks to rotary tables as well as clamping tables, which are available in various lengths and capable of handling different loads. The work envelope also enables pendulum machining for added flexibility. Several design aspects of the Univers 6000 contribute to its amazing accuracy. It starts with precise machine geometry. Another factor is the short distance between the spindle centre line and the Z-axis guide ways, which creates high rigidity. And then there is the water-cooled main drive that ensures thermal stability. In addition, the rigid build means repeatable production of complex work pieces is possible. Operators and work preparers can be confident that parts will be manufactured within the drawing tolerances at all times.